Historically, it was difficult to track transactional email. Developers were never sure if the email was delivered. There are various reasons email can be tripped up along the way. Email can bounce, ISPs can throttle you or you could be marked as spam. A lot of these problems can be avoided with a transactional email service, which will make sure your emails get delivered. But what about tracking these emails? Both marketing and transactional email can be extremely beneficial to a company, but flying blind to the data means missed opportunities. The type of data you can track includes notifications that come from email servers, as well as actions that originate with users. Bounce and throttle messages give you insight into how ISPs are seeing your email. If you’re able to track this data in real-time, you may be able to make changes to improve deliverability. On the user side, it’s very important to stay on top of unsubscribe requests and spam reports, two data points to consider for transactional as well as marketing email. You can also derive great insights from click and open data–not just in aggregate, but on a per-user basis. The SendGrid Event Webhook provides real-time feedback on every email you send across nine event types. A webhook is sort of like a reverse API. Rather than requesting data at the moment you want it, you register a URL that can accept a known format as new data is available. In the case of the SendGrid Event Webhook, you need to be able to consume the event JSON that SendGrid sends as new events occur. 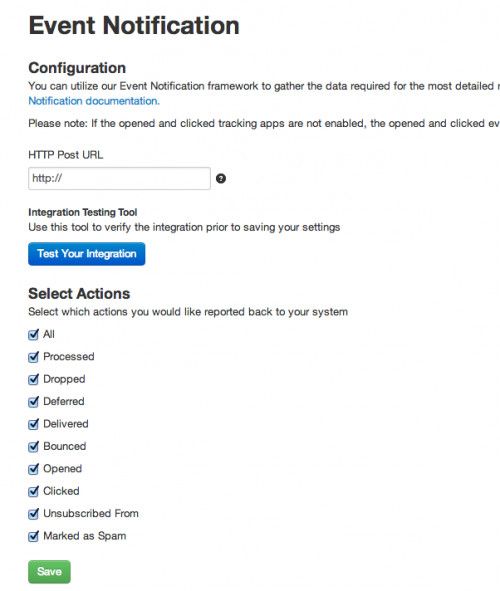 You need to enable the Event Notifications App while logged into your SendGrid account. The settings for the feature allow you to choose only the events where you want to receive data. For example, you may only want to know about spam reports and unsubscribes. This would allow you to react to these events immediately and ensure you never send to the associated address again. Or perhaps you want to track engagement. For this, you’d be most interested in click and open events, though you might also want to receive delivered events so that you can generate the percentage that have clicked or opened. This data is also available via the SendGrid dashboard, but the Event Webhook allows you to bring the data directly and immediately into your own application. There are so many ways you could track transactional email (or all email) using the Event Webhook. For more ideas and a deeper look at how events are structured, download our Event Webhook Guide for free.